Scorpion finally released the Clutch; a premium leather jacket for street and track riders wanting the best of both worlds. Engage your gears! Armed with an aggressive cut and integrated armor, but equipped with power stretch panels the Scorpion Clutch Leather Jacket blends a tough, technical look with a refined level of comfort. Sas-Tec CE® approved armor protects the elbows and shoulders internally while additional external polymer barriers add an extra layer of defense to the shoulders. Top-grain 1.2-1.4 Monaco leather functions as a rugged exterior but is corrugated in the elbows and lateral sides of the torso: key movement areas. With the large leather panels of the chest and back being perforated for breathability and the GP Air Hump acting as a ram air intake to pipe cool air into the core of the jacket; the Clutch is clearly ideal for the warmer months but a removable Everheat insulated liner can be thrown in for chillier evening rides. The Clutch is available in three colorways: Black with White or Hi Vis accents or White with Black and Red accents. 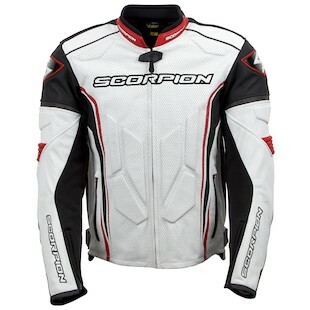 Launch into Spring with the latest from Scorpion’s premium Exo Line: The Clutch Leather Jacket!